This appendix introduces and briefly describes how to use Caché support for the WS-Management specification, which enables you to remotely monitor a Caché instance via SOAP. Following the WS-Management specification, the SYS.WSMon package provides a web service that you can use to remotely monitor a Caché instance. It is functionally similar to the SNMP interface (see the Monitoring Caché Using SNMP appendix of this guide) and WMI interface (see the Monitoring Caché Using WMI appendix of this guide), but uses the built-in Caché web services support. The Caché Monitoring Web Service (SYS.WSMon.Service) that provides methods that return information about a Caché instance. A Caché web client (SYS.WSMon.Client) that can invoke methods in this Monitoring Web Service or in the Monitoring Web Service of another Caché instance. Instead of using this web client, you can create your own web client, possibly using third-party technology. Several XML-enabled classes that this web service and client use to represent monitoring information. These classes include SYS.WSMon.wsEvent, which can represent events. A sample event sink web service (SYS.WSMon.EventSink) that can receive and process events. Via a SOAP call, you can subscribe to this sample event sink service so that it will receive events from any Monitoring Web Service. Instead of using this sample, you can create your own, possibly using third-party technology. These classes are available only in the %SYS namespace. Your event sink web service can perform any processing needed by the business. For more information, see the WS-Management specification (http://www.dmtf.org/standards/published_documents/DSP0226_1.1.pdf). Returns an instance of %XML.DataSet that enumerates the statistics for all buffer sizes. For this instance, the dataset uses the Sample() class query of the SYS.Stats.Buffer class. For information on working with %XML.DataSet, see the chapter Using Datasets in SOAP Messages in Creating Web Services and Web Clients in Caché or see the class reference for %XML.DataSet. Also see the class reference for SYS.Stats.Buffer. Returns an instance of %XML.DataSet that enumerates all databases for this instance. For this instance, the dataset uses the List() class query of the SYS.WSMon.wsDatabase class. See the comments for EnumBuffer() and see the class reference for SYS.WSMon.wsDatabase. Returns an instance of %XML.DataSet that enumerates statistics for all system resource seizes. For this instance, the dataset uses the Sample() class query of the SYS.Stats.Resource class. See the comments for EnumBuffer() and see the class reference for SYS.Stats.Resource. Returns an instance of %XML.DataSet that enumerates statistics for all write daemons. For this instance, the dataset uses the Sample() class query of the SYS.Stats.WriteDaemon class. See the comments for EnumBuffer() and see the class reference for SYS.Stats.WriteDaemon. Cancels the subscription for a given web service; see EventSubscribe(). Subscribes the given web service to receive information about events in this Caché instance. This can be your own web service or can be the SYS.WSMon.EventSink web service, which is provided as an example. If you create your own web service, it must follow the WSDL of the SYS.WSMon.EventSink web service. Where server is the server on which Caché is running, and port is the port that Caché uses. For each event, Caché will attempt to call EventSink() method of the given web service, sending an instance of SYS.WSMon.wsEvent. This method returns an ID that you can use to cancel the subscription; see EventCancel(). Returns an instance of SYS.Stats.Disk that contains metrics of disk usage for globals for this instance. See the class reference for SYS.Stats.Disk. Returns an instance of SYS.Stats.ECPAppSvr that contains ECP application server metrics for this instance. See the class reference for SYS.Stats.ECPAppSvr. Returns an instance of SYS.Stats.ECPDataSvr that contains ECP database server metrics for this instance. See the class reference for SYS.Stats.ECPDataSvr. Returns an instance of SYS.Stats.Global that contains global metrics for this instance. See the class reference for SYS.Stats.Global. Returns an instance of SYS.Stats.Routine that contains routine metrics for this instance. See the class reference for SYS.Stats.Routine. Returns an instance of SYS.WSMon.wsSystem that contains system information about the Caché instance. See the class reference for SYS.WSMon.wsSystem. The SYS.WSMon.Client class and related classes are a Caché web client that can invoke methods of SYS.WSMon.Server web service in the same Caché instance or another Caché instance. Where server is the server on which Caché is running and port is the port that the Caché web server uses. Create an instance of the web client class. Set its Location property if needed. This is necessary if the SYS.WSMon.Server web service that you want to use is on a different machine than the client, or if it uses a port other than 57772. Set other properties if needed. See Creating Web Services and Web Clients in Caché. Examine the value returned by the web method. The details depend on the web method you invoke; see the section Web Methods of the Monitoring Web Service and see the class reference for the return types. More typically, you create and use the client programmatically, perhaps to retrieve data for display in a user interface. Remember that the SYS.WSMon package is available only in %SYS namespace, which means that you must be in that namespace to perform the steps described here. 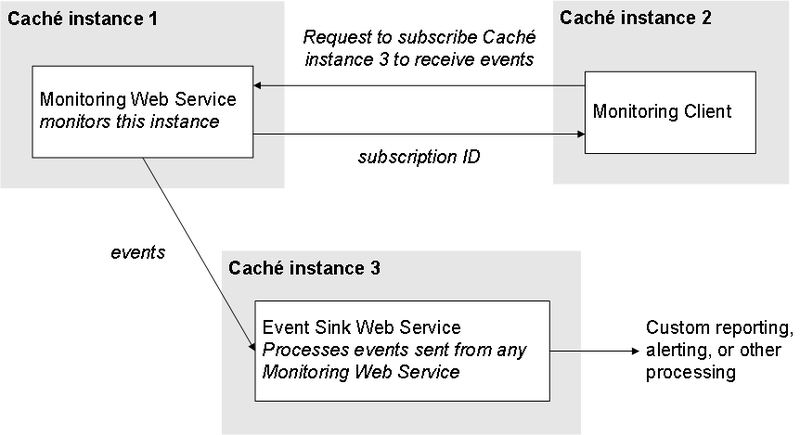 Caché provides a sample web service (SYS.WSMon.EventSink) that can receive and process events sent by any Caché Monitoring Web Service. You can use this web service or create and use your own. SYS.WSMon.EventSink is a sample Caché web service that can receive and process events. On Windows platforms, this sample method displays a popup window when an event occurs; for other platforms, it adds an entry to ^SYS("MONITOR","WSMON","EVENT_RECEIVED",$h). This method always returns 1. Here eventsinklocation is the URL for the event sink web service that will process events. For details on using this wizard, see Creating Web Services and Web Clients in Caché. Then modify the CacheEventSink() method in the generated web service to include your custom logic.